The halfway point. It's hard keeping track of everything, but today I went to a few talks, fought some fires and lunched with some academics at a restaurant imaginatively called La Tequila. Professors and doctors all, but we talked as much about football and music as their specialist chosen subjects. 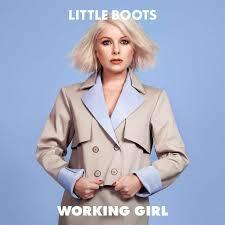 This evening's concert was Little Boots. To be perfectly honest, Victoria Hesketh (for she is Little Boots) has passed me by until this year, but we were looking for a female artist and something a bit lighter than the other acts, and Victoria fit the bill. A bit of Kylie (and as small as), a bit of St Etienne, all wrapped up in an 80s veneer. Her latest release is a concept album, of a sort. A working girl who promotes girl-power and runs her own label. She's also duetted with Jean Michel Jarre and Phil Oakey, and plays an MS20 on stage, which kind of clinched it for me.